For the first time in 16 years, a presidential candidate visited the greater Binghamton area. 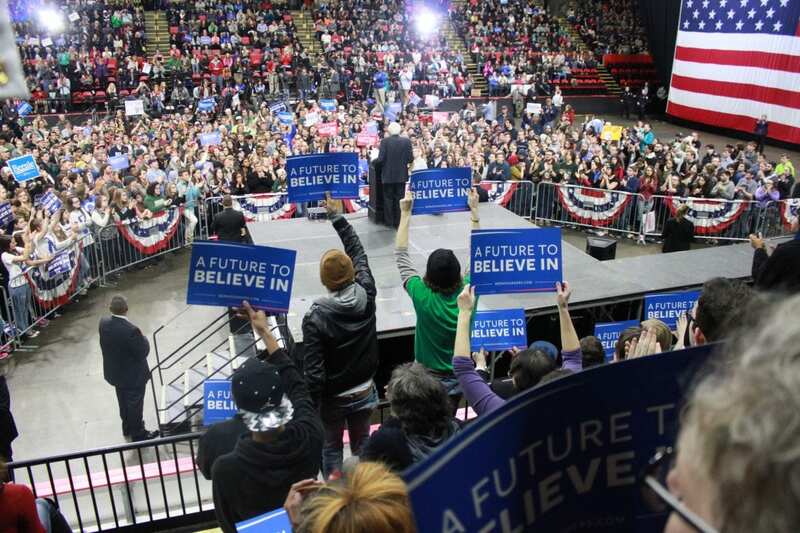 The Floyd L. Maines Arena in downtown Binghamton reached capacity as thousands gathered to hear Bernie Sanders speak. Some traveled from Ithaca and Oneonta and even Scranton, Pennsylvania. Jake Meiseles was wearing a Cornell University sweater. He and his friends drove in from Ithaca the night before and woke up early to secure their spot, but he said they still weren’t the first ones there. There were a lot of people around Meiseles’ age, and that wasn’t surprising. The Sanders campaign has resonated with younger voters. The Vermont Senator directed parts of his speech towards them. “All of the pundits and the media, everyone was saying, ‘Well, young people, they’re not really interested in politics. They’re not interested in government. They’re very busy with their video games or whatever else.’ But what we have seen through this campaign is young people understand the simple truth: you are the future of this country,” Sanders said. But not everyone is interested in the future Sanders talks about. Nick Hutchinson had his Make America Great Again hat on and supports Republican Donald Trump. Still, he couldn’t deny that seeing a presidential candidate is a rare opportunity. “Bernie’s coming here and no one usually comes here, so why not make the stop?” he said. Hutchinson plans to attend a Trump rally on Saturday in Syracuse. New York’s presidential primary is April 19th.